As a fitness coach focused on helping people lead stronger, more energetic lives long term, I rate Gift of Injury very highly. Here's why I think it should be required reading everyone engaged in athletic pursuits at any level. 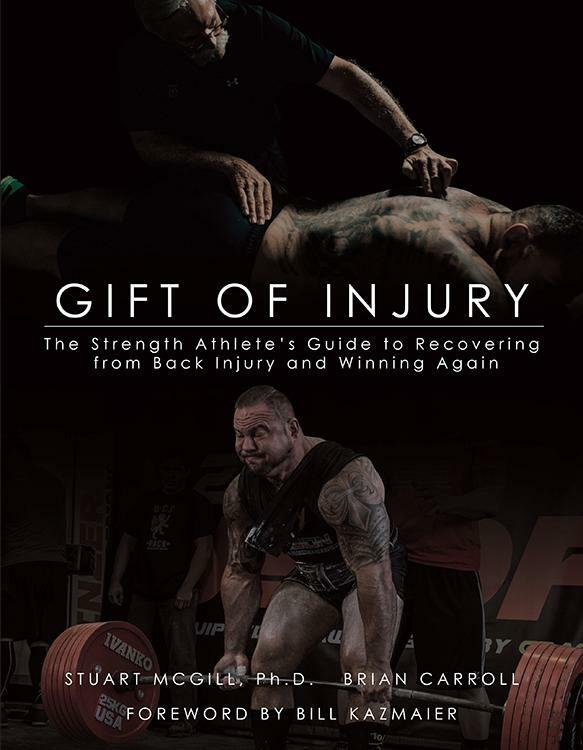 Gift Of Injury is written by spine specialist Dr. Stuart McGill and multiple record holder in powerlifting Brian Carroll. 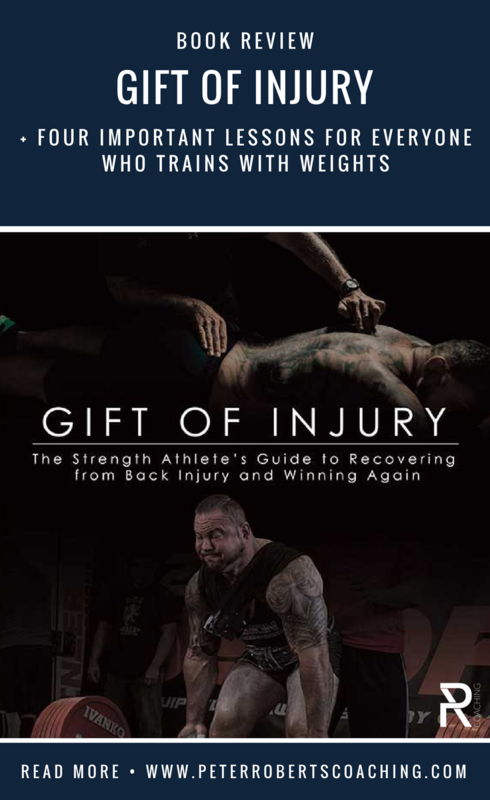 The book follows Brian's journey as he went from non-stop debilitating back pain to being able to get back on the platform pain free and performing at an elite level. Although most of us aren't (and never will be) world class lifters, this book shares important lessons for anyone who trains with weights. It's easy to read and is accessible to the average person. No PhD required to get through this tome! What are the biggest take aways? There're plenty of nuggets in there, but for me, these were the four most impactful points in Gift Of Injury. There are plenty of nuances that contribute to excellent lifting technique. A lot of it isn't natural or automatic. It needs to be taught and practiced. But that’s the point. From day one, find someone who can help you learn those key technique details. Then practice them on every rep.
Not only does this lessen your risk of injury. It leads to better long term development. Incorrect technique is a major reason for getting stuck at early performance plateaus. Better technique gives you more potential - the potential to lift more weight, to train more without being sidelined by injury, and to eliminate weak links. Seems obvious enough, but stay with me here! My experience tells me that your idea of core training and Dr McGill’s method may be very different, and that's worth investigating. His methods focus on eliminating movement in the trunk and spine. Whereas an exercise like a sit-up intentionally bends the spine as you crunch up, exercises like planks, loaded carries, bird dogs, and deadbugs are all about holding the same position in your spine while allowing your limbs to move freely around it. The book details many of these exercises, but the main argument is that we should train the core like we use the core: to create stiffness and stability. Training the core in a way that causes repeated bending is less effective and has a higher chance of leading to back injury. As kids growing up, many of us dream of playing under the bright lights of our favourite pro-sports league and emulating the heart and skill of our childhood heroes. Later on, most of us realise that won't be in the cards. Dang. So then what? What role will fitness and training play in our lives at this point? What are we training for? There are so many reasons to participate in fitness activities, from maintenance to high performance, and everything in between. After a decade of coaching, I can say that having clarity on where you want to sit on that continuum (and why) leads to a much more satisfying and productive experience. How far you want to take your fitness potential and what constitutes an acceptable minimum standard is up to you. And it changes over time. But we shouldn't fall prey to the myth perpetuated in the fitness industry that relentless hard work is all it takes to get to the top. Don't get me wrong. Hard work will get you a lot further than many people think! Every week I see people surprise themselves with how strong and fit they've become. But at the same time, to become truly elite, you need something extra. It's called natural ability. It's not fair, but we don't all possess equal amounts. The people at the very top of sport work obsessively hard and are also blessed with extraordinary potential. That's right. You're all unique snow flakes. Pat yourself on the back. Follow the principles, but adapt them to what works best for you. Maximize performance and minimize risk. In other words, if you want to learn something about getting really strong, study what powerlifters (and other insanely strong athletes) do. But be careful if your goals are different. Borrow the concepts, but customise them to fit your needs. Don't shy away from those differences. Embrace them and you'll get better results. Check out my excellent article on healing your back pain here. It received a lot of positive feedback so far and I hope it can help you too.